Rose isn’t like the other orphans at St Bridget’s Home for Abandoned Girls. Instead of dreaming of getting adopted by loving, wealthy parents, Rose wants to get a job and be independent. She doesn’t need anyone but herself. She finds her escape working as a maid for Mr. Fountain, an alchemist. Unable to ignore the magic that flows throughout the grand residence, Rose realizes that just maybe; she might have a little bit of magic in her too. Rose imparts that delicious sense of wonder found only on magical adventures – adventures like those that began with stepping through a wardrobe, or the brick wall of platform 9 and 3/4. But while this book is lovely on the one hand, on the other it’s just not the next Harry Potter, as some have claimed it to be. Still, between magical mayhem, talking cats, lost orphans, and an evil witch, there’s a lot of fun to be had here – and in fact there were so many classic elements wrapped up in this story I found myself getting downright nostalgic as I read it, in the best of ways. And it’s that sense of familiarity that makes this book so fun – of course that’s not to say this book is a copy-cat, or a regurgitated mash-up of fantasy tropes, because it’s not. It’s just this story has that familiar air, one that reminds me why I fell in love with these types of stories in the first place. And so our story begins with an orphan (of course), leaving her strict orphanage behind to tackle the wider magical world – as a below-stairs maid. Because you see, Rose’s dream is not to slay a dragon or marry a prince, she just wants a job – and it’s that practical nature, that perspicacious determination to earn her own way, that makes Rose so very wonderful as a heroine. And as Rose works doggedly to keep her place, despite the strange magic sprouting everywhere – not least of all within herself – this story also casts a gentle look at matters of class and privilege (as magic belongs firmly above-stairs, you see, and is not for the likes of Rose at all), which enriches the world (and story) in wonderful ways. And so Rose is the firm heart of this story, a grounding force on all the magical shenanigans taking place around her – and she is without doubt the reason I enjoyed reading this book. 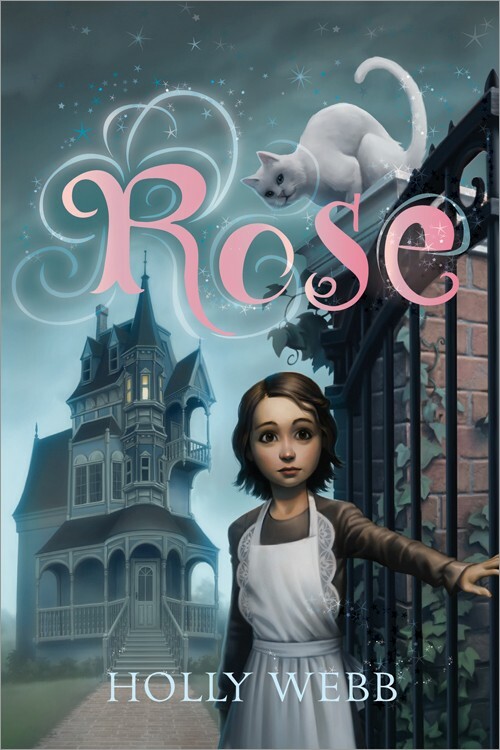 And yet, despite my fondness for Rose, I also couldn’t help but notice the plot was a bit watery at times – and yes, this is a very young middle grade kind of story, but still I thought things were a bit loose, and a bit contrived, particularly towards the end. The defeating of the villain especially smacked of fairy-tale contrivance – the magical save in the nick of time – and it just stuck out a bit in terms of tone, as it didn’t quite match the rest of the story. So while my attention never lagged, I did find myself wishing for a bit more plot to support the goings on – because while magic is all very well and good, I think in these types of stories it’s far too easy to fall into the trap of letting the magic save the day, instead of the people wielding it – as rather happened here. But still, I did enjoy the adventure of it all, particularly in the scary moments, and the story wraps up well with a suitably happy ending. And so, while it may not have been perfect, in the end this is still exactly the type of story I most love – an old fashioned magical adventure – and an entertaining one at that. So yes, I will definitely be back for Rose’s next adventure. Older readers will be as enchanted as the middle-grade audience for which this was intended, as they find themselves returning to the magical reads of their childhood. I think you captured this one perfectly when you said it was an ‘old-fashioned magical adventure.’ I like to think that part of that is British charm, and part is the plucky, disadvantaged girl doing bigger and better things than anyone expected (my favorite sort of story growing up). Great review!